The aviation sector is growing at a staggering rate – and so are the greenhouse gas emissions caused by flying. Still, the industry is planning to start offsetting the growth of its emissions. But can the offsetting of emissions be done successfully? The information in this article is largely based on the Aviation emissions report (in Finnish), co-funded by Sitra and the Finnish Environment Institute, that was published on 15 January 2019. Currently, the carbon dioxide emissions from aviation account for approximately two per cent of all CO2 emissions generated by human activity. However, in terms of warming the climate, the role of aviation is bigger, about twice as large. 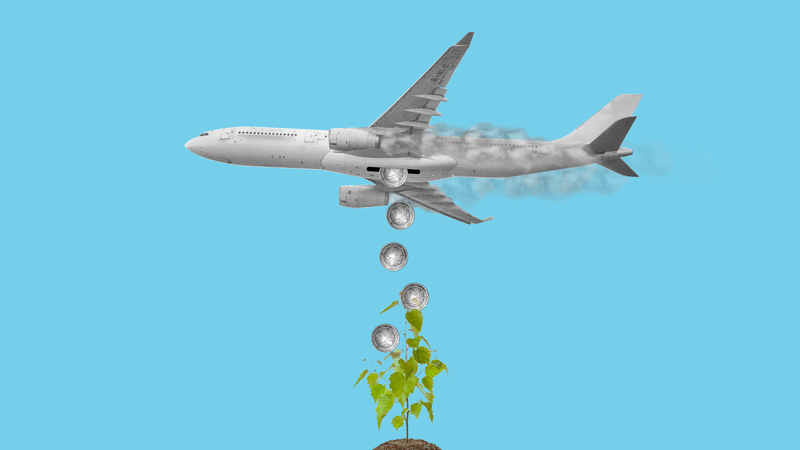 Considering the cumulative effects – also including factors other than the carbon dioxide – air transportation’s impact on global warming is currently around four per cent. As regards greenhouse gas emissions, the most disturbing feature is the rapid growth rate of air traffic. Today, air traffic is increasing at an annual rate of five per cent and is thus expected to double in around 15 years. This will also increase the greenhouse gas emissions, but their growth rate is slightly slower, since the aircraft technology is becoming more efficient as well. The annual growth of environmental impacts is estimated to be slightly above three per cent. Even at such a growth rate, the increase in emissions is alarmingly high and rapid. When the global aviation emissions currently amount to slightly under 0.9 billion tonnes of carbon dioxide, according to certain estimates, by 2050 they would already be three times as high, amounting to around 2.7 billion tonnes of carbon dioxide, unless major improvements in technologies or aviation fuels can be achieved. In practice, the technologies will certainly keep developing, but not at a sufficiently fast rate compared to the growth in traffic rates, so emissions will inevitably increase as well. For comparison: in 2017, Finland’s total greenhouse gas emissions amounted to 55.5 million tonnes of CO2 equivalent. In other words, the global aviation industry as a whole produces about 16 times more emissions than the whole of Finland. If the annual aviation industry emissions were to reach the said 2.7 billion tonnes of carbon dioxide by 2050, it would mean that at that point flying would be an alarmingly significant source of CO2 emissions: the Intergovernmental Panel on Climate Change (IPCC) and climate scientists have calculated that in 2050 the human-induced CO2 emissions should not amount to more than six billion tonnes in total if we realistically want to keep the warming of our climate under the 1.5 °C level. Any warming above this limit is already generally considered to be very dangerous. The International Civil Aviation Organization (ICAO), whose members comprise almost all the world’s states, has announced that it will aim to make the growth within the aviation industry – that is, the projected growth, not the entire sector itself – carbon neutral from 2020 onwards. The figure below shows how the aviation sector intends to reach this self-defined goal. Even though the figure is from 2010, and it fails to include domestic flights, it still serves as a future road map for the aviation sector. It can also be found on the Finnish Transport and Communications Agency Traficom’s Trafi talks website (in Finnish). 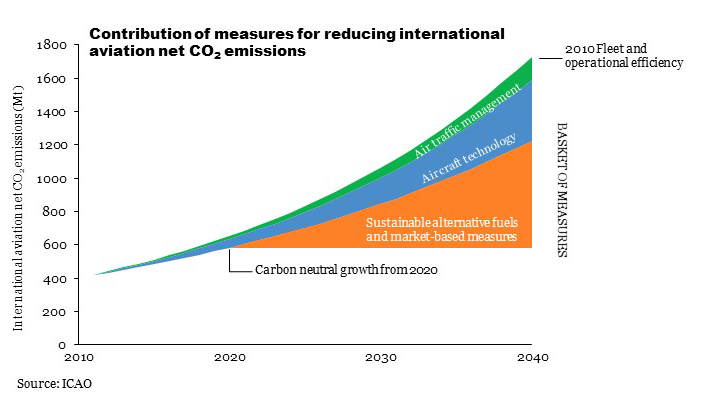 An estimate of the contribution of measures for reducing international aviation net CO2 emissions (domestic flights are not included in the figure). Sources: ICAO and Traficom. The figure shows that the development of aircraft technology and other improvements enhancing the efficiency of air traffic are expected to contribute to the reduction of the emissions growth rate, but the industry intends to deal with most of the growth by means of alternative aviation fuels and market-based steering measures. Since the share of alternative aviation fuels is negligible, at least for the time being, and they are not expected to play a major role in the near future, in practice it is clear that the sector mainly intends to address the future emissions growth by using “market-based steering measures”. With the “market-based steering measures” the aviation industry primarily refers to the Carbon Offsetting and Reduction Scheme for International Aviation (CORSIA), which was agreed upon at the ICAO’s General Assembly in 2016. This is the first global industry-specific system for the management of CO2 emissions in the transport or industrial sector. From 2020 onwards, CORSIA aims to limit the growth of CO2 emissions from international flights to a level not exceeding the average emissions rate of 2019-2020. If the emissions increase, aircraft operators are to acquire emissions units from the carbon market. The growth in CO2 emissions would therefore be offset by the purchase of emission allowances from sectors outside the aviation industry. The offset requirement applies to aircraft operators that fly routes between states that are members of the CORSIA system. In other words, domestic flights and the emissions caused by them will be left outside the system. This naturally reduces the contribution of the system to the prevention of global climate change since domestic air traffic produces a large share of the emissions. The mitigation of these emissions is not included in the CORSIA system, leaving the responsibility for mitigating them to individual countries (or associations of states). So far, no concrete offset measures are taken under CORSIA, but the intention is to begin in 2021. CORSIA also lacks criteria for the carbon credits to be purchased, but ICAO intends to agree on them in the near future. Furthermore, the offsetting system does not take full effect from the start, since the implementation of the offsetting system is divided into three phases: the pilot phase between 2021 and 2023, the first phase from 2024 to 2026 and the second phase between 2027 and 2035. The first two phases are voluntary, with the system becoming mandatory for all aircraft operators of ICAO member states from 2027 onwards. Still, more than 70 states have registered for the CORSIA pilot phase, which therefore covers approximately 88 per cent of international air transportation. According to a preliminary ICAO estimate, in 2025 CORSIA would cost aircraft operators 2 billion euros and in 2030 it would cost 3.9 billion. The sums are equivalent to about half a per cent and one per cent of the industry’s current turnover. However, these sums are eclipsed by what air carriers currently save when aviation kerosene is exempt from tax. A study by the Dutch research and consultancy organisation CE Delf, published in 2013, calculated that if a 20% VAT rate were set on aviation fuel (and other miscellaneous small aviation taxes were abolished) in the EU only, the annual revenues for the EU would increase by at least 7 billion euros. Imposing an aviation fuel tax (33-53 euro cents per litre) would bring annual tax revenues amounting to between 20 and 32 billion euros. The sum would be this high even if the tax rate applied to aviation fuel calculations were much lower than the one imposed on petrol in Finland. It seems that the aviation industry will make a relatively minor contribution, amounting to a modest share of the industry’s turnover, in return for continuing to increase greenhouse gas emissions. When one examines all these figures together, it seems that the aviation industry will make a relatively minor contribution, amounting to a modest share of the industry’s turnover, in return for continuing to increase greenhouse gas emissions. The question of how the emissions offsets included in the CORSIA system will function in reality will also remain hanging in the air. How realistic and solid is the base upon which the system actually rests? In this article, we will not get more deeply into the opportunities for air passengers to offset their personal emissions. Let us just note that such an opportunity does exist, but it is not very commonly used, at least for the time being. However, some air carriers already offer their passengers voluntary options to offset their emissions. The idea of offsetting is that operators compensate for their emissions by financing a reduction in emissions elsewhere. So far, this text has underlined the offsetting of CO2 emissions related to the aviation industry. However, when we begin to study the secrets and boundaries of offsetting systems in closer detail, we must draw the conclusion that the logic of offsetting or compensating emissions is the same regardless of the sector. In other words, the idea is that operators compensate for their emissions by financing a reduction in emissions elsewhere. However, the aviation sector is a particularly interesting case, because it is the first major industry to have created plans for how it will embark on offsetting its emissions on a large scale. One option for an offset scheme could be the official Clean Development Mechanism (CDM), developed during the global climate negotiations. In this case, offsetting would take place through CDM-approved projects. In practice, these projects – such as projects promoting renewable energies or the sustainable use of land and forests – are implemented in developing countries, and they are also aimed at providing aid for such countries. However, the future of these projects is somewhat uncertain, because the interest these projects have attracted has varied in the international climate negotiations. On the voluntary offsetting market, on the other hand, there are several very different operators, including the Swiss Gold Standard, the American Verra and the Finnish Nordic Offset. Furthermore, there are also service providers that acquire and cancel emissions allowances from the EU Emissions Trading System (EU ETS), such as the Finnish CO2Esto. Anyone can buy carbon credits from such operators. There are major variations in the price level and quality between the different operators and various offset projects. This is one of the reasons why the offset system has been criticised. According to the UN, only the kind of projects that produce real, measurable and therefore genuine emissions reductions should be approved as offsets that would not be generated otherwise because of, for example, legislation, taxes, subsidies or the profitability of such measures. When defined in this way, the authenticity of several projects has been called to question, and it is suspected that the emissions reductions thus achieved have been overestimated. According to a survey conducted by the German Öko-Institut, published in 2016, even 85 per cent of the analysed projects approved as CDM projects for the UN probably did not generate genuine emissions reductions. For example, the Swiss Gold Standard certification has clearly more stringent criteria and third-party approval processes than CDM, and the World Wide Fund for Nature (WWF), for example, recommends using Gold Standard projects for the offsetting of emissions. The price formation of carbon emission offsetting schemes is ultimately decided by the sellers of carbon credits. The prices of carbon credits vary greatly between different offset projects. For example, in the first quarter of 2018, the price range of one tonne of carbon dioxide equivalent offset on the “voluntary carbon market” was extremely wide, ranging from about 9 euro cents to more than 61 euros. It is difficult to give an exact average price – the price level is different in different parts of the world, offsets acquired in large batches are usually cheaper than those acquired in smaller batches, and so on – but roughly speaking, it is between 2 and 5.2 euros. The prices set by operators selling CO2 offsetting to air passengers are often higher than the average price above. For example, the German Atmosfair sells carbon offsetting at 23 euros per tonne of carbon dioxide. To complicate matters even more, the prices set for emission allowances (one tonne of carbon dioxide equivalent) are often different from the ones set for CO2 emissions in different countries by, for example, taxation, or in the EU Emissions Trading System. Even though the prices vary a lot by the type of project, it does indicate something that in 2016 the average price for an emission allowance (one tonne of carbon dioxide equivalent) was almost three times higher in Gold Standard projects than in CDM projects. As far as the offset plans within the aviation industry are concerned, we could conclude that the price tag – and probably the level of authenticity – of offsetting future emissions will depend greatly on what the projects used for offsetting the emissions are like in reality. ICAO has not yet defined what kinds of offset projects will be eligible under CORSIA. The sellers of offsets are eagerly awaiting the decision, since it may create a very lucrative growth market for the operators approved by ICAO. There are still major challenges associated with the offsetting of CO2 emissions. Offsetting measures have their limits. In addition to the price and genuineness of offsetting, one must also consider whether any individual economic sector can eventually resort to the kind of offsetting that is implemented in another sector. After all, the threat of a climate crisis would require that every sector make absolute emissions reductions. And if one of the sectors – the aviation industry, for example – still increases its emissions and therefore resorts to offsetting them, is such an offset genuine and reliable? The monitoring of offset projects – such as preventing double counting of offsetting targets – is a challenge. Or preventing, for example, two different offset-sector operators from selling the same project to different buyers, or a country from including the offsets made in its territory in its own carbon reductions, while the buyer of the offset also calculates them as its own reductions. Part of the offset projects are based on planting forests, which does entail the risk related to the permanence of carbon absorption. This risk exists particularly in developing countries, where long-term management of projects is subject to changes. When forests are grown in them, it is very likely that they will end up felled or destroyed by wildfire. If a forest is felled, it should also be replanted – or other measures taken to ensure that the forest maintains its carbon sink status. In all, the impact of tree-planting on climate change is a complicated matter. It has been estimated that only a small share of global annual greenhouse gas emissions caused by human activity can be offset by planting trees. Even though other kinds of estimates have also been presented, the planting of forests is not necessarily an uncontroversial solution to the climate crisis. Projects where wind power is built instead of power plants based on the use of fossil fuels are also eligible as offset projects. However, at least today, it may be difficult to say whether a solar or wind power plant is built instead of, say, a coal-fired power plant. Perhaps a power plant using an alternative source of energy would have been built in any case. Of course, there may be situations where the matter is clearer; for example, if, thanks to the construction of a new solar power plant, an old coal-fired power plant is closed before the end of its service life, and the coal the power plant would have burned remains unused in the future. In Finland, the issue of the restoration of drained peatlands has recently led to extensive debate – in the long run, such a measure would absorb carbon dioxide. However, in the short term, it increases greenhouse gas emissions. Protection of old-growth forests has also been highlighted as a means of carbon sequestration. Even though those restoring peatlands and protecting old-growth forests have stopped referring to their activities as offsetting measures, the Hiilipörssi website of the Finnish Association for Nature Conservation and its co-operation partners still features a carbon calculator according to which the purchase of peatland for restoration, costing 250 euros, would absorb about a tonne of carbon dioxide per annum (in the long run). However, the decision was taken to stop using the term offsetting in this context, because there are so many uncertainties associated with it. The aviation industry should consider a reduction in flying instead of offsetting the additional emissions only. There is also a danger that the act of offsetting emissions gives people – or, say, the aviation industry – an entitlement to make emissions or even to increase them. This would turn offsetting mainly into a modern form of the sale of indulgences or greenwashing. The most important thing, however, should be the minimisation of personal emissions; in the aviation sector this would also mean that the industry should consider a reduction in flying instead of offsetting the additional emissions only. Naturally, the offsetting of emissions is a better alternative to generating emissions without offsetting them in any way, but the offsetting of emissions should not reduce the efforts to cut personal emissions. The offsetting of emissions should not reduce the efforts to cut personal emissions. The view that continuous growth is still possible on our planet with its limited resources is also problematic. It also applies to the aviation industry, which itself predicts continuous growth for itself. Furthermore, it is not enough that the aviation sector only strives to offset the additional carbon emissions it will make in the future. As regards greenhouse gas emissions, all industries should strive for an absolute reduction of their emissions, because, according to researchers, excessive warming of the climate will have catastrophic consequences – for all of us. + Offsetting emissions is one way of combating global warming. + It enables the collection of funding for useful projects. + It creates markets for the “offsetting industry”. + If emissions cannot be prevented, it is better to offset them than to contribute emissions without offsetting them in any way. – The aviation industry is not planning to offset all of its emissions, but only to offset the additional emissions exceeding the current level of emissions. – The offsetting plans within the aviation industry are based on the idea of the sector’s continuous growth. This is a problematic premise with a view to cutting emissions. – It is difficult to find real carbon sinks, because the quality of offset targets varies. – It may steal the attention from the primary need to cut emissions from any type of activity. It may become the equivalent of the sale of indulgences or greenwashing. – The markets for offset targets are still unco-ordinated, and the variation in prices is unreasonably wide.